Ah, just kidding. Good work, buddy! Hey Dave, you might enjoy this choice bit of political Airwolf Humor as a candidate chooses Airwolf to be his running mate. Can you post that supersized so I can make it my wallpaper? Totally Airwolf. It's certainly no goofier looking than the Whirly-Bat. 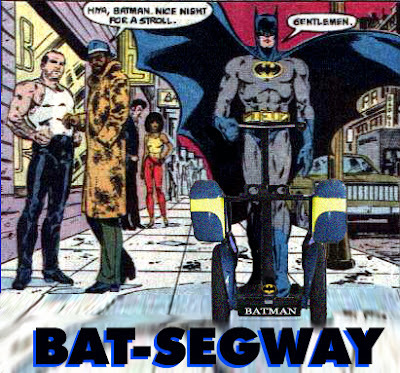 The Bat-Segway, and Batman's face riding it, is the most beautiful thing I have ever seen in my life. There's a company that does Segway tours in downtown Austin. Periodically I'll take my bike downtown -- for some live music or a movie or some sweet, sweet Tex-Mex food -- and I'll them all cruising down Congress Avenue, lined up in a row like a family of ducks. It's all I can do not to ram into them on general principle. Apologies to Segway enthusiasts, but man, I cannot think of a more useless form of transportation. Not even Batman can make it look cool. LOL- it may not be the coolest LOOKING form of transportation- but they are fun! Great job Dave! And Kudos for hearing your public!! 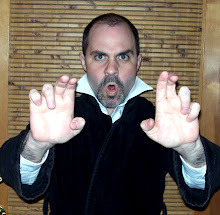 Not to be confused with the Owl-Segways Nite Owl and Rorshach ride across Antarctica! I know Batman is concerned more with justice than law, as such, but surely he should do something about that guy's leather trousers/Norman Osborn Haircut combo? Today you and Sterling posted the most beautiful items. I'm in awe, sir. I'm in awe. Shouldn't that guy be saying "nice night for a roll?" Can that go straight up a building wall? Because the Batmobile can. At least, in Joel Schumacher's world it can. Sorry, that was an easy joke. It's early, it's Monday. my question is this: if the image was originally batman out for a walk as the dialog indicates, then why is his cape billowing up? in fact, the Segway makes far more sense out of this confusing situation. I am in favor of comics also. Although I prefer to oriental type for I am living here. Dave, you rule. Thanks for that. I apologize for being so slow to show my gratitude for your excellent service. My wife and I spent that weekend in the hospital, I drinking very old hospital coffee, my wife trying to push out an eight pound baby. It was a success, by the way. So I got a Bat-segway and a daughter in the same weekend. Nice. Philip! Congratulations man! That's great. Raju and Savitri lived in wow goldTanjore in the state of Tamil Nadu. Raju worked in the rice fields ofwow gold a local landlord or zamindar for six months a year. In turn, he received wow goldfour sacks of rice as salary. He would then sell three of them in the local marketwow gold and keep one sack for himself for food. At the local market he would exchange the rice for wow goldvegetables, flour, and groceries. Savitri would do the cooking and washing and look afterwow gold the home. Onewow gold year there was a severe drought. There was no rain and the rice fields dried up. By April, the two were wow goldgetting tired of eating nothing but rice. So one day, they decided to go digwow gold for tubers. They took an axe to cut firewood and set off. Throughout the day Raju cut branches and Savitri searched around for tubers and mushrooms. In the wow goldevening they sat under a tree exhausted. Raju put down his axe nearby and leaned his back tiredly against a tree.